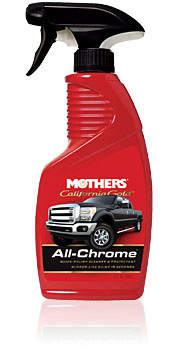 Mothers® California Gold® All-Chrome™ is the quick and easy way to clean, polish, and protect any hard or decorative chrome finish, including chrome plating, PVD chrome, and even today’s chromed plastics. This unique spray polish takes the grunt work out of keeping your wheels, trim and accessories their shiniest, anytime, anywhere. All-Chrome™ effortlessly removes fingerprints, smudges, dust, bugs and even light water spots, leaving behind a protective barrier to keep your chrome sparkling. Just spray, wipe and buff to a brilliant shine!